The Biggerers is a story about several tiny humans known as Littlers. These Littlers are sold as companions to regular sized humans, a sort of pet-like creature. But Littlers are being recalled, slowly at first but then in increasing frequency because something strange is happening. They’re starting to communicate, and that is something Littlers are not supposed to be able to do. This is a long, slow story that follows several groups of characters in tandem. The narration jumps from group to group – from the Littlers to their Biggerers, to a former scientist, to his daughter. Now, if you don’t like jumping points of view the beginning of this novel might be a bit hard to follow. We are introduced to several groups in rather quick succession. Overall, I liked all of these characters. Some were interesting right off the bat, others I grew to love as the story drew on. By the end of the novel I was invested in each of their plots, and wanted the best for all of them. However, there are a lot of characters, so if you have trouble keeping books with a lot of characters straight you might want make note of this before starting the book. The story itself is set on earth at some point in the near future. Everything appears rather the same at first, with some obvious differences. The world is more automated now. Writing with pen and paper is rare. But it becomes apparent rather quickly that this is not simply a future society, but a dystopian one as well. Littlers are, well, tiny people who cannot communicate and are kept as companions – pets, more or less. This is uncomfortable, doubly so with the normality we see in the opening chapters of the book. Neither the littlers nor the biggerers find the situation at all odd. Lilwall draws you into this space that is equal parts comfortable and extremely uncomfortable. Watching the everyday lives of these characters makes the turning point in the novel hit all the harder. That comfortable space – eerie as it is with the keeping of tiny humans as if they were pets – is quickly shattered. The second half of the book is much faster paced than the first half. Around page 200 everything begins to change. Everything we’ve learned is slowly turned on its head. The pacing continues to increase until the very end of the novel – I read the second half much more quickly than the first. The dystopian aspect of the story is brought to the forefront. Characters that were interesting, but seemingly less relevant are suddenly quite important. The strange, uncomfortable aspects are explained. The littlers are more fully explained. While I am of mixed opinion on some aspects of the book – it does bear some uneven pacing and a scenes have the unfortunate habit of cutting off and switching viewpoints right when I was extremely invested in those characters – I really did enjoy this book. There is something there that begs you to read further, even when the pacing may be slow. The characters feel very real, with very understandable motivations. I look forward to seeing what else Lilwall might have in store for us in the future. 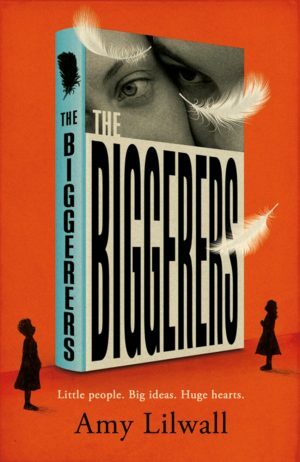 If you don’t mind a book with a slower pace and enjoy a story set in a somewhat dystopian world, I would suggest picking up a copy of The Biggerers by Amy Lilwall.